Hey Brett! Sorry I was very busy with some examns and God of War 3:P Dryptosaurus is a basal tyrannosaurid survivour from basal form like eotyrannus? I didnt see a good pic of this guy since the famous paint of Knight. Yep, it's closely related to another 3 fingered tyrannosaur called Appalachisaurus. Dryptosaurs is known from very fragmentary remains but the newer Appalachisaurus has a lot more to go from. Really nice works youve been doing lately, how big were these beasts? The first tyrannosaur found in south hemisphere! Thanks for the link! I was out all day and would have missed the fun! There are no evidence that Appalachiosaurus was 3-fingered. It is closer to "true" tyrannosaurids than Raptorex and Dryptosaurus, so, we suggest it was 2-fingered. 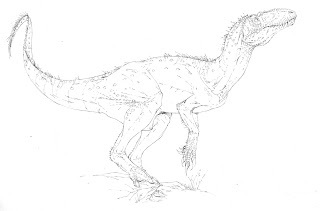 The position of Dryptosaurus (as, therefore, the number of manual fingers) in uncertain. We know it has 2 robust fingers, but we cannot say if he retained a 3rd or lost it. Pending new fossil, I consider your 3-fingered version a good compromise between data and phylogenetic interpretation.Probably, Eotyrannus was more primitive. Thanks for the info! I had a hard time finding out anything about the fingers on his guy, everything said 3 but a few restorations had 2. I went with 3 but I can get rid of the 3rd no problem, photoshop is amazing. I thought I heard something like that for Appalachiosaurus, but all the restorations I've see keep it with 3, and then the mount... which the skull looks nothing like the fossil restorations I've seen.. well it's very confusing so I tend to stay away from it.